Recently, I had a though—if lemon curd, why not lime or orange curd? They were an easy substitutions and they turned out very nicely. The next thought, of course, led me to: Can you make fruit curds with something other than citrus fruit? I looked on-line and the short answer is “Yes.” I found recipes for apple curd, blueberry curd, melon curd, pomegranate curd, and strawberry curd. Apparently you make a curd out of any fruit you fancy. Amanda made her curd with fresh pomegranates. I recently made pomegranate jelly and removing all of the pips from a bunch of pomegranates was a bit much. I thought I would take a short cut and use Pom Wonderful. 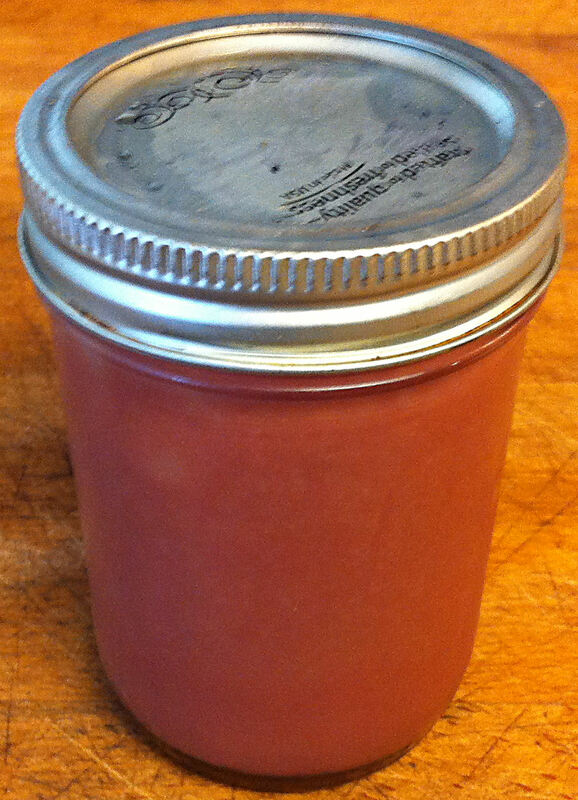 The finished color of the pomegranate curd is a bit unfortunately purple brown. I even added five drops of red food color, but I could not say it was a vast improvement. I think the citrus juice in some of the recipes was added to improve the color. The taste however, especially on french toast, is wonderful. 1. 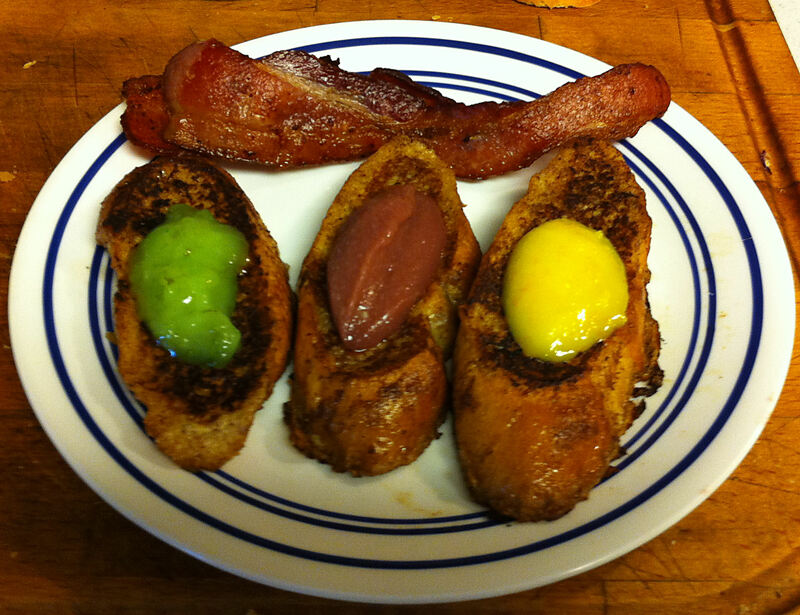 Set the butter and eggs on the counter and let them come to room temperature, about one hour. Note: If you are going to put your curd into jars, sterilize them in boiling water and set them on a clean towel, ready to fill. 2. Measure out ¾ of a cup of pomegranate juice and set the measuring cup aside. 3. In a medium bowl, beat the butter and sugar with an electric mixer, about 2 minutes. Tip: I found that mixer could not break up all of the lumps of butter. Halfway through, I took a fork and mashed the butter bits into the sugar and then continued mixing. 4. Add the eggs to the butter mixture, one egg at a time. Tip: Mix the eggs in for two minutes on medium high between eggs. You want to break up and separate all of the bits of protein in the whites. 5. Beat in the pomegranate juice and continue beating for 2-4 minutes, until most of the juice in incorporated into the mixture. Tip: Stop beating and push the mix out of the way, if there is still a lot juice puddled in the bottom of the bowl, keep beating. When the free juice gets down to about a quarter of a cup you are done. Note: The mixture will look curdled, but it will smooth out as it cooks. 6. Pour the mix into a medium, heavy-based saucepan. Start cooking the mixture over low heat until starts to look smooth. 7. Increase the heat to medium and cook, stirring constantly with a spatula, until the mixture thickens, about 20-30 minutes. Note: I found that the pomegranate mix did not set as quickly as the citrus curds. Tip: Constantly scrape the bottom and sides of the pot. You do not want any hot spots or bits sticking, where they may get over cooked. Never let the mix come to a boil! This would cause the eggs and butter to “break” and you would end up with a flavorful mess. Adjust the heat as necessary. 8. Cook the mixture until well thickened and it sticks to the back of the spatula. Tip: If you find the final color unappealing, stir in a few drops of red food coloring. Note: Fine Cooking says to cook it to 170° F on a thermometer, but I prefer to go by eye. I cook the curd until it “looks right.” Stirring will leave a trail as the curd thickens and you will come to recognize when it is thick enough. 9. Remove the pomegranate curd from the heat and transfer it to a bowl or prepared jars. Tip: This is more of a spreadable egg custard, not a preserve. Do not leave it out for too long and use it up quickly. Even cooked, egg dishes can develop salmonella. Note: The curd will thicken further as it cools and will keep in the refrigerator for a week and in the freezer for 2 months.